Hugh Hewitt: So let’s set aside the Comey firing, which as a Constitutional law professor, no one will ever persuade me can be obstruction. And Rod Rosenstein has laid out reasons why even if those weren’t the president’s reasons. Set aside the Comey firing. 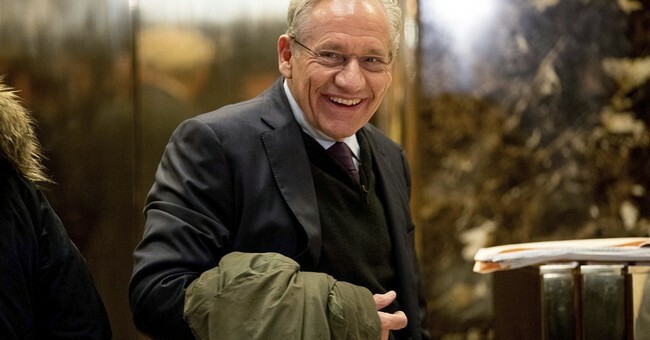 Did you, Bob Woodward, hear anything in your research in your interviews that sounded like espionage or collusion? Bob Woodward: I did not, and of course, I looked for it, looked for it hard. And so you know, there we are. We’re going to see what Mueller has, and Dowd may be right. He has something that Dowd and the president don’t know about, a secret witness or somebody who has changed their testimony. As you know, that often happens, and that can break open or turn a case. Okay—the man who took down Nixon, who tracked a campaign donation to a slush fund within the Committee to Re-Elect The President, said there’s no evidence of collusion, which has been a pervasive theme in this clown show investigation. Wood ward found zilch—and he probably would have found it by now. Any investigative body would have found something to link the Trump team to the Kremlin if this shoddy allegation and liberal coping exercise were true; it’s not. There’s zero evidence of collusion. It’s time for Special Counsel Robert Mueller to wrap it up. Also, Democrats—brace yourselves—your antics over this whole episode will help Trump clinch a second term. Bravo!